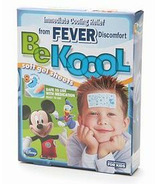 For fevers, headaches, or overheating, Be Koool cooling gel sheets beat ice packs and iced towels cold. Be Koool gel sheets lower skin temperatures by up to 4 degrees. That cooling relief not only lasts for up to six hours, the gel sheet directs all that coolness where you place it because unlike messy wet towels and ice packs, Be Koool comfortably adheres to the skin. Also unlike towels and compresses, Be Koool requires no refrigeration. Just peel the backing off of the gel sheet, place on your child's forehead and you're done. No constant trips to re-ice the towel. And, Be Koool is safe to use with medication, too. What a comfort. For you and your child.